This otter looks similar in appearance to the closely related North American river otter, although the Neotropical otters are smaller in length. The area around the mouth is nearly white. The three different subspecies have three differently shaped noses. A good picture example of this can be found here. 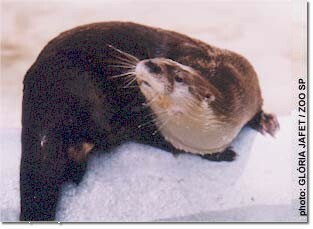 Like all river otters, the Eurasian has a thick, cylindrical, elongated body set on short, stocky legs. Their short, dense fur is a brownish-grey color with paler undersides and throat. The thick, conical, muscular tail tapers from the base to the tip. They have a soft, wooly undercoat covered by coarse, shiny guard hairs. These guard hairs keep the undercoat dry when the animal is wet, keeping the animal warm and insulated. Unlike other aquatic mammals like seals, otters lack an insulating layer of body fat, so they rely solely on their fur to keep them warm and dry. Their head is rounded and flattened, with small, round ears set low on the head. Their muzzle is short and broad, and rounded in shape, and covered in thick whiskers. The thick neck is short, and is as wide as the head. They have small, round eyes that are set high and wide apart. The nose is shaped like a trapezoid, with the longer side on the top. The paws are webbed, and they have five toes on each paw. Otter's front legs are shorter than their back legs, and this allows them to swim better. When otters swim slowly, they paddle with all four webbed paws. When swimming quickly or diving, the shorter front paws are kept close to the sides of the body, and the back legs and powerful tail propel then through the water. The ears and nostrils can be closed when they dive underwater. Females have 2 pairs of mammae. The neotropical otter has no fixed breeding season. Like other otters, there may be a delayed implantation after breeding, but the period of time is unknown. The young otters are born fully furred, with their eyes closed. Their eyes open at 44 days old. They begin to venture outside the den at 52 days old. At 74 days old, they join their mother in the water for short ventures. Time of dispersal for the cubs has not been documented. Males do not help raise the cubs. Males and females only meet for breeding for one day a year. The neotropical otter is solitary and diurnal. Some otters have become nocturnal in areas where they are disturbed by humans. They scent mark by leaving deposits of feces in raised areas near deep water, such as logs and bridges. This is thought to advertise sexual status. They vocalize by whistles, hums and screeches. This otter excavates a burrow on land near a permanent fresh water source. These burrows are often near tree roots or rocks, but can sometimes be caves or shallow crevices in limestone. The neotropical otter was hunted extensively for its fur. It has become extinct throughout much of its range as a result. They are currently protected by many countries throughout its range. Natural predators of this species include anacondas, jaguars, birds of prey, caimans, and wild dogs. 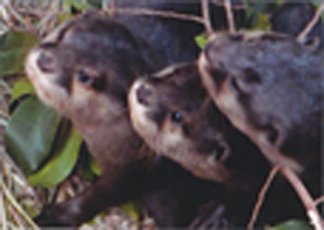 There are three distinct subspecies of the Neotropical otter, Lutra longicaudis annectens, Lutra longicaudis enudris and Lutra longicaudis platenisis. The neotropic otter used to be classified in the Lutra genus, but has since been placed in the current genus Lontra along with the other three species of new world otters. Many authorities still place all otter species in the Lutra genus, regarding the variations between different species as subgenera.